In 2012 you didn’t have to look hard to find some Wall Street analysts hitting the panic button on Keurig Green Mountain, but today it's two years older and $100 higher. So what happened? To say that 2012 was a rough year for Keurig Green Mountain (UNKNOWN:GMCR.DL) would be an understatement. 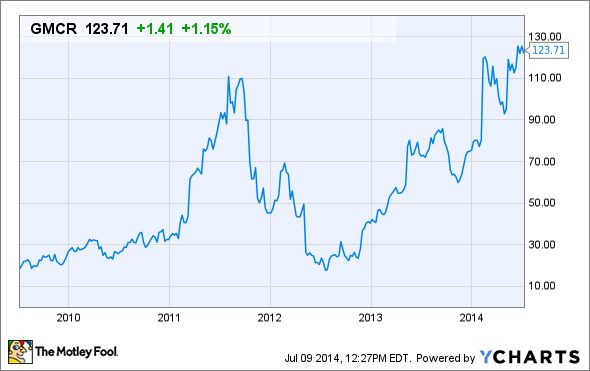 Shares went from trading at more than $100 in mid-2011 to less than $20 in mid-2012. Analysts left and right were downgrading the company, slapping sell ratings on shares at will. Most notably, David Einhorn led the bearish rampage against the company by giving his now-infamous 110-slide presentation on how the company was doomed. The overriding bearish thesis of the time was based primarily around the expiration of the company's K-Cup technology patent in September 2012. For years Keurig held a monopoly on the single-serve pack industry. The idea was that when the company lost the exclusive right to produce these high-margin packs, lower-cost competitors would move in and capture huge chunks of market share. As expected, in September 2012 the patent expired. Yet here we are today, with shares trading at around $125. It's two years later and the sky still hasn't fallen, so what happened? So why haven't low-cost competitors moved in and pulled the rug out from under Keurig? Keurig executives recognized well in advance that September 2012 would eventually roll around and thus dedicated the company to building up a massive arsenal of licensed partners. Today, the company has more than 50 owned, licensed, partner, or private-label brands in its system. That expansive network -- more than 290 different beverages in total -- includes names such as Starbucks, Dunkin' Donuts, Newman's Own, Tully's, Snapple, and Van Houtte. Thus, even when these low-cost competitors finally moved in, many of the biggest name brands were already covered by Keurig. Consider this: last September Keurig-licensed brands accounted for 79% of the single-serve pack market in the U.S. (Keurig's primary market). The remaining 21% was split up between various unlicensed brands, including, most notably, Kraft Foods' (UNKNOWN:KRFT.DL) Maxwell House and Peet's Coffee & Tea. While 21% is certainly nothing to sneeze at, it is nowhere near as drastic as some analysts were calling for back in 2012. The bottom line is that Keurig still controls the lion's share of the market despite its lack of patent protection. Keurig is not happy about the loss of nearly a quarter of a market it once held a monopoly in. Thus, in an attempt to regain its former status, Keurig is redesigning its entire system and calling it Keurig 2.0. The new brewers, which are slated to be released this fall, will now have the ability to not only brew a single cup of coffee but also an entire carafe. Even better, these new brewers will include technology that prevents the brewer from functioning with cups supplied by unlicensed competitors. Such "unlicensed competitors" are obviously not thrilled with the feature, and one, TreeHouse Foods (NYSE:THS), has taken it so far as to sue Keurig. As to whether Keurig will be allowed to integrate this technology or not, the answer is uncertain. But even in the worst-case scenario, Keurig's expansive network of big-name brands should only continue to grow and further enable Keurig to gain back market share. For Treehouse, Kraft, and the other companies that currently produce unlicensed pods for Keurig machines being shut out from the next generation would be bad, but not devastating. For Kraft and Treehouse especially, these pods only account for a small portion of overall company sales. Worst case scenario, these companies would have to make licensing agreements with Keurig, trimming their margins. A small margin haircut, however, is something both of these companies would happily receive to keep their hands in the rapidly growing, Keurig-driven beverage industry. If you had listened to Einhorn and the overall Wall Street consensus back in 2012 and shorted Keurig Green Mountain at $20, you'd be down more than 500% today. The morale of the story: Even without the protection of patents, Keurig has proven that through its expansive network of licensed brands, it can still dominate the U.S. single-serve pack market. This fall the company will attempt to take back its monopoly status with the launch of Keurig 2.0, but even if this effort gets legally overturned, the company will remain in a dominant position.